– William Richard Morris (Lord Nuffield) introduced some of Henry Ford’s production line methods in Britain in 1924 and became Britains largest car facturer in the mid ‘20s. – The Minor was introduced at the 1928 London Motor Show, Olympia, Morris’s belated riposte to the Austin Seven (1922-1939). Only this Fabric Saloon and a Tourer were available in 1928. From 1930 the other models were offered. – Chassis and drive train have been designed by a subsidiary, “EC Wrigley & Co Limited”, a gear manufacturer in Soho, Birmingham, that Morris had bought after bankruptcy and renamed "Morris Commercial Cars". – The engine has been largely redesigned at Wolseley (founded by Herbert Austin), a company personally owned by William Morris. Engine, clutch and gearbox mounted as a unit at four points on rubber washers. – The engine was expensive to produce and often had to contend with oil in the generator, so that in 1931 a simpler side-valve motor was designed, which is almost the same performance: 19 bhp at 4.000 rpm. “the £100 motor-car”. 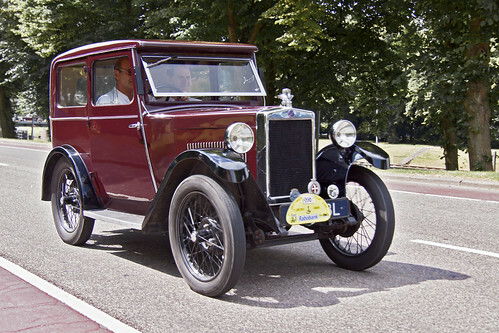 Until 1932 both versions were manufactured parallel (47,231 units built). – The Minor Series 1 was available as this two-doo Fabric Saloon, as two-door four-seater Tourer, as two-seater Sports, as four-door Family Saloon, as Sports Coupé, as 5cwt Van and as rolling chassis for various customs, like a two-door Coachbuilt Saloon and a four-door Coachbuilt Saloon.